This poster subject concentrates on the birds which migrate between the zoogeographical Palearctic region and southern Africa which is the southernmost part of the Afro-tropical region. The Palearctic region encompasses the northern hemisphere countries of Europe, north Africa, Asia north of the Himalayas, the Middle East and northern Arabia. Birds breed in these areas during the northern hemisphere’s summer months when there is a rich supply of food and ideal breeding conditions. As the winter in the northern hemisphere is severe, food sources are frozen over or reduced and birds are compelled to migrate south to more favourable habitats. 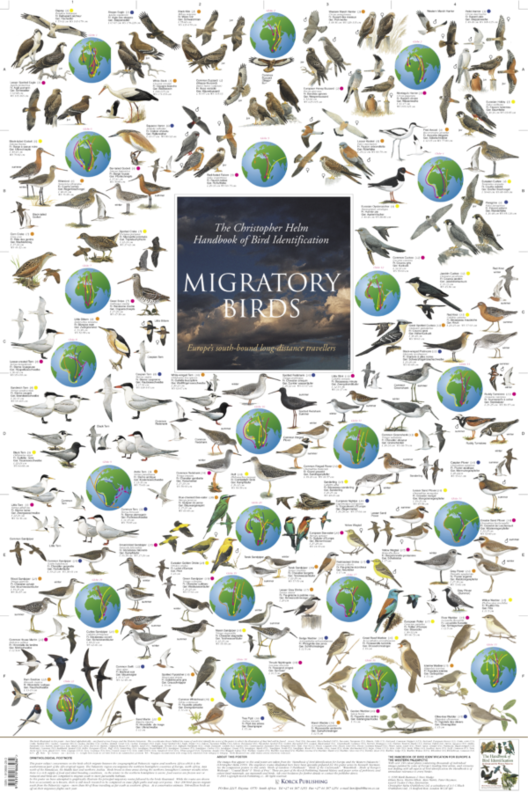 In this poster we have attempted to graphically illustrate the principal migratory routes followed by the birds illustrated. While the routes are shown here as accurately as is known, there is still much research to be completed on exact flight paths and stop-over points. Most birds follow routes where food sources are available eg coastlines, rivers and lakes. Very few land birds undertake long ocean or desert crossings. But the most amazing group of migrants are the diminutive warblers weighing only a few grams, migrating by night, navigating by the stars between northern Europe or Siberia to southern Africa where they spend the European winter months, returning 6 months later to breed. 200 bird species migrate south from the Palearctic region – more than 80 of these travelling as far south as southern Africa. At a conservative estimate, 500-million birds set off on their migratory flights each year. Among the bird families represented on this poster are: bee-eater, buzzard, crake, cuckoo, eagle, godwit, harrier, martin, plover, redshank, sandpiper, shrike, tern & warbler.